Social Isolation - the curse of the self employed? Social Isolation is a phenomenon that is often associated with the elderly. I do believe that it effects many other people too and can be a curse of those working from home. This is a long post, but I really hope you read it through to the end. I had a visit from a very wise friend recently. We were chatting about my new circumstances. A quick update for anyone who may not know I had to give up work in December due to ill health. I am now ‘pottering about’ doing a bit of writing, working on my blog and exploring opportunities for the future where I can create an new career where I can work part time, but also on my own timetable to fit it with when I feel well enough. My friend listened to what I had to say and then asked me about social isolation. I laughed and said oh don’t worry about me I am very outgoing and I am always out and about. This isn’t entirely true as sometimes I am physically too sore to do too much. Working from home is becoming more and more commonplace both for the self-employed and for people who have the option offered by their employers. There are great perks. You can put a wash on between calls, nip out to collect the kids from school or even to buy a bottle of milk. There are downsides too and social isolation is one of these. Social isolation is defined as the complete or near-complete lack of contact between an individual and society. It differs from loneliness, which reflects a temporary lack of contact with other humans. Social isolation isn’t a choice, it is something that creeps up on you while you are busy. I strongly believe that there are degrees of social isolation. An ‘at home’ worker can spend hours a day alone. I am quite happy with my own company for much of the time, however the value of social interaction is huge. Spending time with colleagues and friends is one of the best forms of communication. Conversation sparks ideas and thoughts and generally gets us out of ourselves. Social isolation can lead to depression, social anxiety and a loss of self-esteem. This can result in the ultimate vicious circle where you might become more reluctant to interact socially and withdraw even more. Since I have been ‘home alone’ for the last six months I have been very conscious of the fact that I no longer need to get up in the morning, do my hair and make-up and go off to work. Although I have not missed all the office politics, I have missed the chats around the kettle, lunches with colleagues and meetings. I have also missed getting dressed up. I just love meetings. I love the interaction and flow of ideas. I enjoy deadlines and the challenges of working as a team to beat them. So how to ensure that we don’t suffer from social isolation? My partner says this what I do. Seriously though if there is any opportunity to interact I take it. I have attended coffee mornings, focus groups, blogger events and meet-ups. Martha Fraser who recently organised the Shine Adventure an event for online businesses facilitates free meet-ups in different areas. A couple of hours and a cup of coffee with online colleagues – a great idea. The Women’s Inspire Network started by Samantha Kelly (aka Tweeting Goddess) also holds great networking and inspirational events. Lunch or even a morning coffee (or tea and a scone if you are me) is a great way to break up the day and to have a good natter. I have been very brave and grown my network by simply asking. If I have been following someone online that is very interesting, I will call up and ask them to meet me for lunch. What is the worst that can happen? They could say no or perhaps they will say yes and you will have made a new friend and contact. I really enjoy social media and see a huge value in it both in terms of keeping up with friends and family and making new connections. I have a wonderful group that I created with a friend called Fabulous Woman – it inspires me every day. The key with social media is to know how much is enough? I aim to spend enough time to be inspired and connected without spending so long that I start suffering from FOMO (the Fear of Missing Out) and a feeling of isolation – where I start to imagine the whole world is having a better time with more friends and more cocktails than I ever will. I love linking point 2 and point 3. Meet someone on Social media and take it off-line – invite them to tea! A diary has been my constant companion in all the years I worked. It still is. It is a great way of not only organising yourself, but also creating balance in your life. I try to schedule at least one – out of the home office – activity a week. Keeping a diary also helps to track what I do work on, so at the end of the week I can sit back and reflect on what I have achieved and what did and didn’t work. I also use my diary to remind myself (I suffer from the odd bit of brain fog) to set up calls with my family and friends far and wide. We are lucky to live in an age of technology where you can have a chat with an old school friend as though they were in your living room. I have even carried the iPad around the house showing off my cooking prowess. Regular readers of my blog will know that I am an avid convert to the daily walk. I try to get out every day dodging the showers if necessary. I was walking a couple of days ago, enjoying the sunshine in my bright blue coat. I smile and say hi to anyone I pass on the road. I was walking along in the town and a gentleman looked at me and said – my you have a happy face. I wished him happy Monday and moved on. These are some tips and ideas that I have used and would suggest. 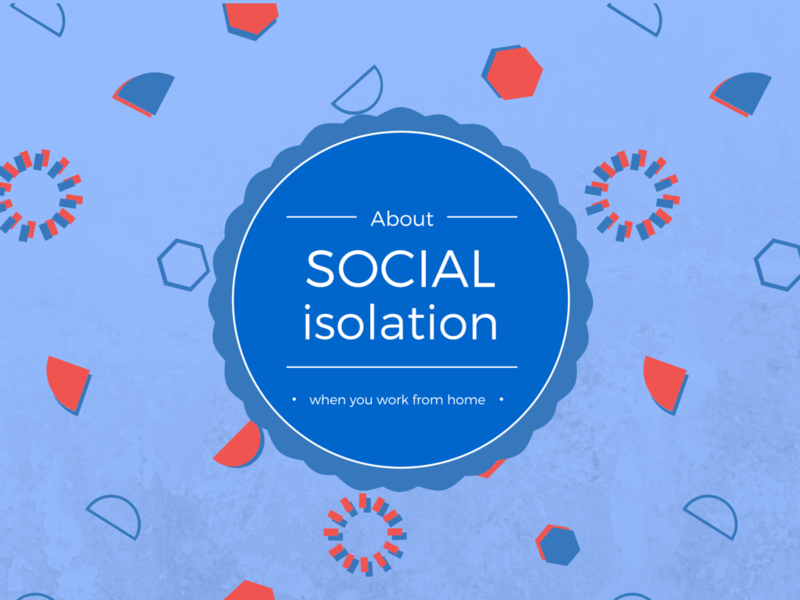 There is a way to prevent social isolation when you are working from home, and I do believe it needs to be a conscious choice. May is mental health month and as someone that has suffered with depression over many years I think it is important that we raise awareness for mental health.